A slim hand tool for all those little, delicate pruning jobs - and perfect for Bonsai! 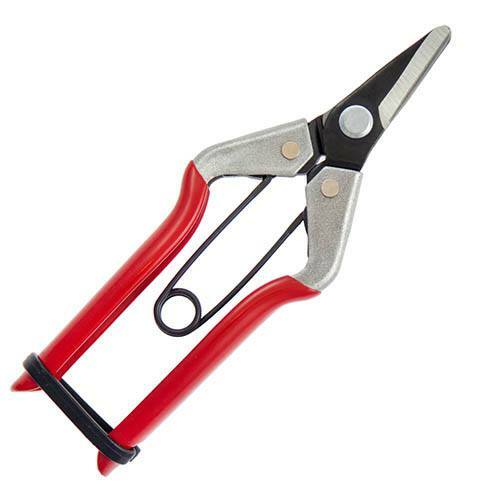 Suitable for cutting through thin stems and stalks, this pair of snips are perfect for fine, delicate pruning. The tips of the curved blades are rounded to avoid damaging nearby flowers or fruit. Made from high Carbon Tool Steel, with rubberised handle protectors for added comfort. Precision ground blades are coated for improved rust resistance. Lightweight & pocket sized for general light pruning, these handy snips are suitable for cutting through thin stems and stalks, and are perfect for fine, delicate pruning, such as bonsai, or wherever you need to be able to work with precision. Make light work of collecting fruit such as grapes and currants or use them for cutting flowers for indoor displays - their slim handle and blades make them extremely easy to use. The tips of the curved blades are rounded to avoid damaging nearby flowers or fruit so you can use them with ease and be safe in the knowledge that you are only snipping what you need to! Incorporating a simple and effective safety catch, the non-slip, rubberised handle protectors provide a comfortable grip and are easy to use - ergonomically designed to sit perfectly in your hand. Made from high Carbon Tool Steel, the precision ground blades are coated for improved rust resistance and are easily sharpened when necessary.